Birthday party, End of Term, Youth groups or just for fun. Due to younger children wanting to play Battle Zone we now have 12 Uzi machine guns. These guns work with our large MP5 guns but are lightweight and easy to use. These guns are perfect for our Bambino parties aged 6 - 8 years. We do run these sessions slightly different to our normal Battle Zone sessions because of the age of the children. We start from 6 years not because of the guns being heavy, but because of the missions we play. We give the children missions and objectives to complete, so if you add younger than 6 years into the session they will not understand what they are doing and it can ruin the birthday soldiers party because we end up not being able to complete the missions. Please see our Facebook page ‘BattleZone Live’ for up to date information regarding special events and Open Games coming up. 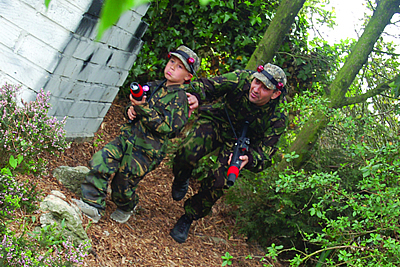 We recommend parents play with the Bambinos as they enjoy shooting the adults and its a great family experience for everyone. But you don’t need to, you don’t even have to stay, you can just leave your number and we will take care of everything. But you must come back and get your children. You will need to be here about 15 minutes before your start time to get ready for the start of the session, so you can sort out any coveralls and any outstanding payments. PLEASE wear appropriate footwear. No flip flops as we are playing war games outside. Also gloves in the winter are recommended. We only have 12 Uzi guns for 6-8 year olds, but adults can play with the MP5 guns so you can book for more then 12 players, just as long as you have no more then 12 bambino soldiers. You can have over 8 year olds playing i.e. siblings, as well as parents at birthday parties or parents can stay and play alongside children, but will need to be paid for. We only charge children’s prices for any adults playing with these parties. You will not fight for the full 2 hours because we end the session with the food..
Sheltered seating area for people not participating. When booking your party please just check the items you require, making your party booking as personal as you want. If you have any special requirements like food allergies etc… then just fill out the box supplied or you can contact us on 01424 423778 between 9.30am - 5.30pm.